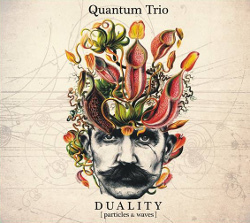 “This is the debut album by the Quantum Trio, which consists of Polish saxophonist Michal Ciesielski and pianist Kamil Zawislak and Chilean drummer Luis Mora Matus. It presents ten original compositions, three of which were composed by Ciesielski, one by Zawislak, four by Matus and the remaining two by all three members of the trio. The music is mostly serene, intimate and reflexive, with strong and beautiful melodic themes and a distinct Classical influence. The chamber ambience is also emphasized by the lack of bass, which usually supplies the Jazz pulsation, not present here. Nevertheless this is undoubtedly a Jazz album, although the music is very elegant and almost lofty, somewhat similar to the Scandinavian touch. Contrary to what the trio publishes in their promo materials about their music, all of the music herein is perfectly composed and arranged and shows no traces of spontaneous composition / improvisation. The personal contributions by all three trio members are without reproach; Ciesielski plays delicate, long phrases with beautiful intonation and great sensitivity, Zawislak masterly accompanies the saxophone parts and plays elegant solo parts and finally Matus ornaments the music with his rich palette of percussive sounds, showing great imagination and a lot of skill.